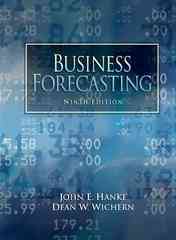 Business Forecasting 9 Edition KEY BENEFIT: The ninth edition of Business Forecasting presents basic statistical techniques that are useful for preparing individual business forecasts and long-range plans. Written in a simple, straightforward style and making extensive use of practical business examples, the book includes many cases that provide readers with the necessary link between theoretical concepts and their real-world applications. Readers should have a basic knowledge of statistics and be familiar with computer applications such as word processing and spreadsheets. KEY TOPICS: The book first presents background material such as the nature of forecasting and a quick review of basic statistical concepts; proceeds with the exploration of data patterns and choosing a forecasting technique; covers averaging the smoothing techniques and time series decomposition; emphasizes causal forecasting techniques such as correlation, regression, and multiple regression analysis; and concludes with judgmental forecasting and forecast adjustments. MARKET: Useful as a reference for students and professionals with job titles including: forecasting manager, marketing manager, production manager, and analyst.